A Guide to the Okanagan Wine Industry – The Most Complete Guide of Okanagan, Similkameen and Shuswap Wineries. 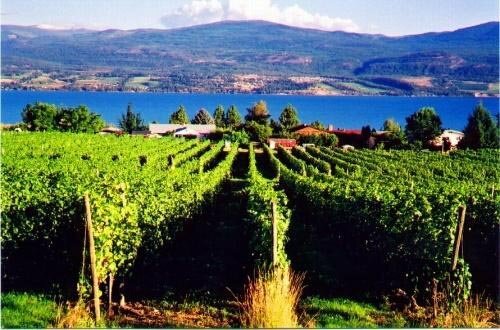 TripAdvisor, an online travel website, has named the Okanagan Valley one of the top 10 wine destinations in North America. The survey was taken by more than 1,000 Americans, 48 per cent of whom indicated they planned to visit a vineyard this year. “As the only Canadian wine region on this list, this is a true badge of honour for the Okanagan Valley and its cities,” says Nancy Cameron, CEO of Tourism Kelowna. In the survey, the Okanagan Valley ranks sixth. “The TripAdvisor accolade comes on the heels of some significant editorials about the Okanagan Valley in publications such as Sunset Magazine and Endless Vacation Magazine,” says Kelly Reid from Penticton and Wine Country Tourism. The Napa Valley and Sonoma wine regions of California topped the list. The survey comes out as the Okanagan Valley is set to host its 29th annual Fall Wine Festival, October 1 to 11. Looking for a Winery or Vineyard property? Bo has all the connections with the industry and resources to introduce you to all available properties and help you make an informed decision. Looking for a wine country home, a resort property or a country acreage? 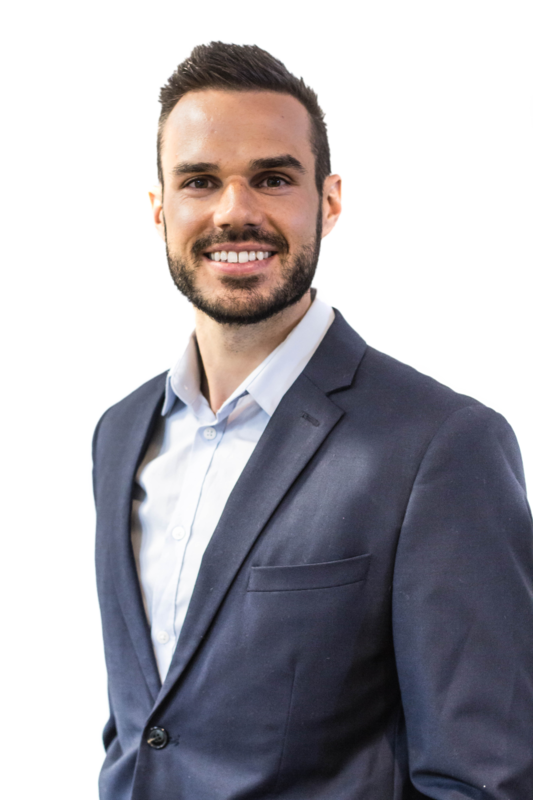 Bo can help you find the right property for you, throughout the Okanagan Valley. Thinking of selling? Call Bo to discuss how to get the best results, fast! Bo Knows Vinears, Bo Knows Wines and Bo Knows Okanagan Real Estate. 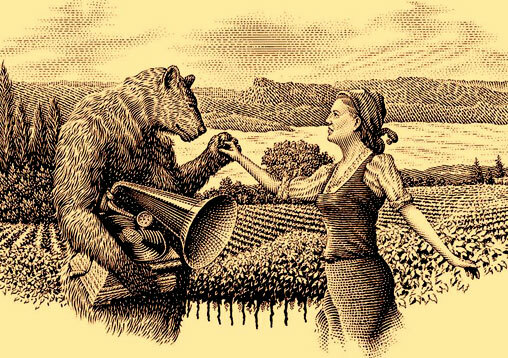 If you’re looking for vineyard or winery property, shouldn’t you know Bo? The most complete guide for wineries in the Okanagn, Shuswap and Similkameen Valleys you will find anywhere! There are also a lot of helpful links to help you get acquainted with the Okanagn wines and wine in genera. There are also my picks of my personal favourite wines and wineries, as well as my observations on wine and the wine industry, as a consumer. Kelowna, West Kelowna, Lake Country & Peachland Wineries. Our wines are carefully grown, caressed and finessed rather than simply made, bottled or produced. We believe that wine is elevated from product to craft by careful attention to all aspects of viticulture and winemaking; choice of land, selection of varietals, clones, rootstocks, pruning, cropping, hang time, press method, barrels, time in oak, blending and bottle aging. – Platinum Pinot Noir – Rating: 90. The first BC Pinot that impressed me. – Ehrenfelser – Rating 89. The best summer patio wine. Like inhaling peaches and apricots! Consistently well made wines throughout the range. The dream has become a reality; welcome to Ex Nihilo. We invite you to experience Ex Nihilo’s new Tasting Room and winery while enjoying our award winning wines. We are thrilled to have you visit our brand new 8000 sq. ft. winery and Tasting Room designed by Jeff Harder. In designing the modern Mediterranean style winery, Jeff focused on creating a winery that not only would reflect the meaning of Ex Nihilo and our wines, but also a destination where our guests can enjoy a truly unique Okanagan Valley wine experience. – Ex Nihilo Merlot 2006 Rating: 89. Silky & smooth. Easy to drink now or hold a few years. 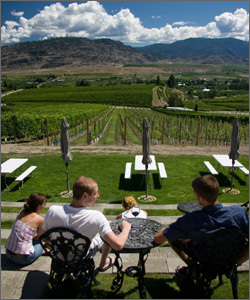 Overlooking the Okanagan Lake, the winery has a breathtaking view and an old-world charm. Our philosophy is to let the terroir and varietal characteristics be fully expressed. The estate fruit is hand picked when optimally ripe and gently fermented and processed to preserve quality. Combining that with organic practice our wines are truly a unique experience. Mt. 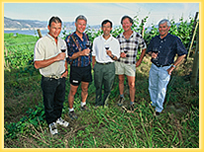 Boucherie Estate is poised at the forefront of the Okanagan wine industry. A long time dream of the Gidda family, the winery uses 100% estate-grown grapes from the family’s vineyard holdings, BC’s largest family owned and operated. – ’06 Summit Reserve Syrah – Rating: 89. Tremendous value for $24.95! Mt. Boucherie has a great many good wines, all at a reasonable price point. Nice people and easy to visit year round. 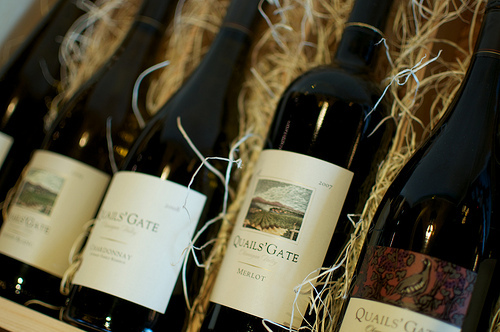 Quails’ Gate is internationally recognized as one of the world’s quality producers of Pinot Noir and Chardonnay. The entire portfolio of Quails’ Gate is consistently endorsed by wine experts as being one of the Okanagan Valley’s best. Quails’ Gate wines offer great quality and value, offering an authentic snapshot of premium British Columbia Vinifera varietals that have been influenced by terroir, viticultural innovation and winemaking expertise. – ’08 Old Vines Foch Reserve – Rating: 90. A cult classic from 45 yr. old vines! – ’08 Reserve Pinot Noir: Rating: 91 Elegant Pinot at its best. I think the Chardonnay is great, as well! Definitely a different experience! Rollingdale marches to its own drummer and owner Steve Dale is quite entertaining. You may luck into a barrel tasting in the Quonset winery, just minutes from downtown Kelowna. I always enjoy visiting and I enjoy the wines. Certainly not a mainstream winery and worth the visit! – ’07 “La Gauche” Cabernet Sauvignon – Rating: 90. Ageworthy Cabernet Sauvignon. – ’08 Pinot Gris Icewine: Rating: 91 Sumptuous and lush. Dessert in a glass! To create great wine you must start with the soil and vines, so our first focus at Sandhill is the vineyards. Each of our Okanagan Valley vineyards have unique characteristics that are expressed in wines made from that vineyard. Which is why Sandhill makes only single vineyard wines and we put the specific vineyard name on the label of each wine we make. – ’08 Small Lots Syrah – Rating: 91. A very impressive Syrah! – ’09 Small Lots Viognier- Rating 89. A great follow up to the stunning 2008. Tropical fruit, spice, apricots, peaches & pears. I’m a big fan of Sandhill’s Small Lots Program. Several of these wines are in my cellar. 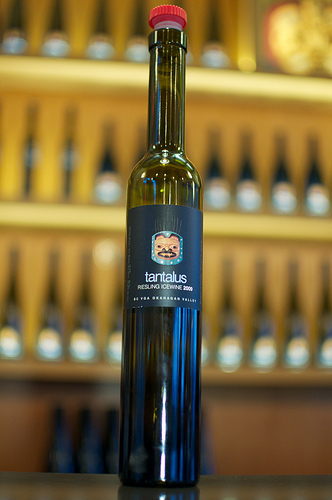 Tantalus’ winemaking philosophy is centered around the concept of terroir, or sense of place. All of our wines are made from fruit sustainably grown at our estate vineyard. A non interventionist approach to the winemaking process allows each wine to convey the fine quality and unique character of this historic vineyard. – Old Vines Reisling ’08 – Rating: 91. Classic Riesling! Dry and crisp and best left in the bottle a couple of years. – Classic Cuvee ’04 – Rating: 90. One of the Okanagan’s best sparkling wines! Toasty, yeasty, classic! Nature deals some fine cards to the Okanagan’s vineyards.But perfect grapes – like perfect poker hands – are rare indeed.ACES’ Holger Clausen holds the cards: he knows how and where to source the Valley’s best varietals. As the Okanagan’s preeminent independent harvester, his knowledge of the Valley’s terroir – and his relationships with growers – is without parallel. – Seven Deuce Shiraz/Cab – Rating: 88. Incredible value for $17.90! Foxtrot Vineyards is a small family-owned and operated winery located on the Naramata bench in the Okanagan Valley, British Columbia. 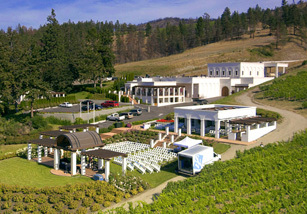 The winery specializes in ultra premium Pinot Noir and Chardonnay and has received praise from top sommeliers and international wine critics alike. The wines are sold in many of the top restaurants in BC and Alberta with limited amounts available through our website as well as select wine stores. – ’07 Pinot Noir – Rating: 93. Canada’s finest Pinot Noir. Outstanding! – ’08 Chardonnay – Rating 92. Burgundy style with elegance and power. Chardonnay to age! One of my favourite wineries! 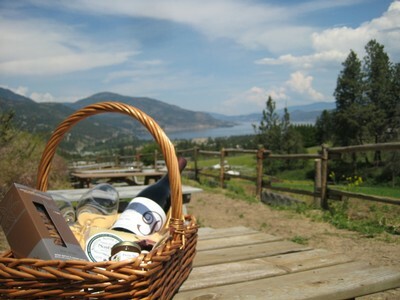 We are located on the beautiful Naramata Bench in the heart of the Okanangan Valley. At LA FRENZ , we believe the quality in the bottle begins in the vineyard. Cutting edge and meticulous vineyard practices are used in combination with varieties tailored to the unique soils and micro climates of our vineyard sites to produce the vibrant and intense grape characters found only in the Okanagan Valley. The potential of the resulting fruit, using experience and careful stewardship throughout the vinification process, is maintained and enhanced to create exceptional wines that truly reflect the grape variety and vineyard site. – ’08 Shiraz – Rating: 90. A cool climate Rhone style Syrah. Older versions aging very well! – ’09 Sauvignon Blanc – Rating 90. A crisp dry Sauvignon Blanc. Great value at $22. ’08 won Double Platinum at Northwest Wine Summit. Too many good wines here to just pick a couple. Visit LaFrenz and see why my cellar is full of their wines! Everything is good – it’s hard to lose! Marichel Vineyard is a small winery producing limited quantities of fine wine. All our wines are made from grapes grown exclusively on the Naramata Bench. Okanagan Lake provides a vast thermal sink to moderate the excessively hot and cold temperatures common to arid regions. It’s a “Goldilocks” appellation: not too hot, and not too cold. From both a geographic and winemaking perspective, the heart of the Okanagan Valley is the Naramata Bench. Ideally situated to capture the maximum amount of sunlight, and nurtured by the moderating influence of Okanagan Lake, “The Bench” epitomizes the often claimed- but rarely realized- perfect terroir. – ’07 Syrah – Rating: 92. Ripe & concentrated but not jammy. Years of bottle age ahead! – ’09 Splitrock Viognier – Rating 89. Lovely now but will age well unlike most Viogniers from BC. The wine we make is reflective of the land from where the grapes come from. Our Philosophy has been about allowing the vineyards to really express the uniqueness of the grape varietals planted there, and then to have minimal intervention in the winemaking, being caretakers of the fruit and allowing the wine to be the showcase of what makes the grape and land special. – ’08 Invictus – Rating 92. Wow! This Bordeaux blend is smooth and elegant now with lots of ageing potential. At $29.99 it’s a bargain! – ’08 Merlot: Rating 88. Probably still available at your favourite wine shop this represents outstanding value! Buy it if you find it! There are several good wines, but I have restricted my picks to two wines. I’m particualrly impressed with the quality and values of the red wines. Named for the pictographs that border our 60 acre property, Painted Rock is singularly committed to the production of ultra premium Okanagan wines. We believe that our particular terroir and site influences present a unique opportunity to create exceptional wines worthy of the most discriminating palates. To that end we adhere to the strictest protocols in our estate vineyards and throughout the winemaking process, employing the best modern technologies and expertise, while respecting old world traditions. Please join us in the pursuit of our passion and the creation of truly outstanding wines. – ’07 Red Icon – Rating: 93. Excellent Bordeaux style wine (interesting blend) needs lots of time in the bottle. Not priced for the faint of heart! – ’07 Syrah – Rating 90. Nice peppery, spicy Syrah. Good now but will age well. This winery came on the scene with a bang in 2009. I like the Chardonnay, as well, and the Cabernet Sauvignon won the Lieutenant Governer’s Award also. Moon Curser’s three vineyards are on the highly desirable Osoyoos East Bench. And somewhat similar to Sarah Palin, we can see the USA from our kitchen window. Our six acre homestead vineyard was planted in 2005 and now in its seventh leaf. Six rather unique varietals are planted here: Tannat, Tempranillo, Carmenere, Viognier, Roussanne, Marsanne. – ’09 Border Vines – Rating 91. Bordeaux style with six Bordeaux varietals including Carnmenere. I think it’s their signature wine and great value at $25. – ’10 Afraid of the Dark – Rating 89. A classic Rhone white with 43% Viognier, 42% Rousanne and 15% Marsanne. Dry and crisp. I loved the wines when it was called “Twisted Tree”. The new Moon Curser wines I have sampled are equally good or better. The wine making philosophy is to grow great fruit in the vineyard, maintain this fruit character through careful steps in the wine making, and finally, to perfect the texture of the mouthfeel of the wine with the use (or not) of barrels and fining. Great wines are grown in the vineyard, period. 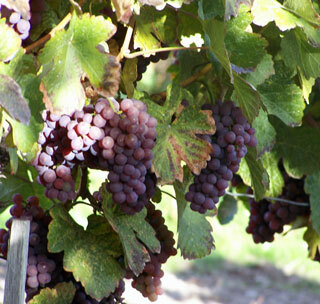 Grapes brought in from the vineyard at a certain level of quality cannot be made into a higher quality wine. Thus, we use good growing practices and low cropping yields to ensure that the vines and fruits receive the correct amount of sunshine, water and nutrients to put them in a position to make great wine. – ’09 Old Vines Chenin Blanc- Rating: 88. Great as a summer patio wine or a food wine from 40+ year old vines. – ’09 Rockpile – Rating 90. 60% Syrah with just about every red grape from Bordeaux and the Rhone thrown in. Interesting! Road 13. It’s all about the dirt! Lots of good wines here. I have picked a couple of my favourites but there are lots more good ones. I have to confess! I’m a wine guy. For years I have enjoyed traveling to different parts of the world, visiting wineries and tasting wines, and bringing a few back home with me. I have to admit that a number of years ago, I wouldn’t have considered touring and tasting at BC wineries. Now, I want to tell the world about them! What happened to change my mind? Up to about 1986, the BC wine industry lived in a protective cocoon of tariff protection. Their wines were mediocre, at best, made from a number of lesser grape varieties. About that time, the North American Free Trade Agreement came along and the protective tariffs were removed. “We’ll go out of business!” cried the wineries, at the time. Instead, they adapted, learned to make world-class wines, and many new wineries have come into existence. Traditional high quality vinifera grape varieties from around the world are being cultivated, with excellent results. Areas under cultivation have more than doubled during the last few years, and the wine industry is booming. The transformation is nothing short of amazing! I’m pleased to tell you that the BC Wine Industry is producing excellent wine and visiting wineries, touring and tasting their wines and learning about the different Okanagan wines is a real treat! If you haven’t tried it yet, there’s no time to start like the present. Every year there are more new wineries and the wines and grapes just get better and better. The scenery is breathtaking every where you go there is a new visual treat to behold. There are new restaurants, new accommodations and other attractions. You owe it to yourself to discover Okanagan wne country! The first bottle that kindled my interest in Canadian wine did not originate in B.C., it came from Ontario. It was 1990 and I was on a bicycle tour of the Niagara region with a couple of friends. Our third stop was this tiny winery called Marynissen Estates which had just opened its doors that year. The wineshop attendant, who could have well been the proprietor John Marynissen himself, poured us a taste of the 1989 chardonnay of which he was clearly proud. One taste and I was hooked. I bought four bottles and drank them within the next two weeks. Little did I know that same wine would go on to win best of show and best vinifera at the American Wine Society competition that fall. To me it was simply a great wine. I can’t recall how that wine tasted now. But the impression it left is the reason I’m writing these columns today. I knew then that despite less than stellar beginnings, the Canadian wine industry had the stuff needed to compete with the big boys. Much has changed since, in both BC and Ontario. The industry locally has grown exponentially. In Ontario, the development in the last decade has also been notable, but the pace has been much slower than here, it seems. I attended a wine seminar on Ontario wines at Whistler’s Cornucopia wine festival. It had been some time since I had the opportunity to sample a broad selection of Eastern wine, and well, there are few available locally. The Ontario wine industry is the largest in Canada with more than 90 wineries producing $338 million worth of product off of 12,000 acres of grapes (we have about 6,000 acres planted here). Yet producers have had a heck of a time convincing consumers, restaurateurs and even their own liquor board of the value and merit of their wines. Hulley says the wine drinking public in Ontario is still stuck on European, U.S. and Australian wines. Many top-end restaurants don’t list a single Ontario wine. Local producers can certainly attest to how important the restaurant market is to their business. Perhaps the biggest challenge eastern winemakers have is the distribution system. It’s not so hot here, but in Ontario it’s downright appalling. There are no VQA stores or privately operated beer and wine shops. Outside their own winery stores, distribution of local wines is solely in the hands of the Liquor Control Board of Ontario (LCBO). The monopoly held by the LCBO is mind-blowing. It is the largest single buyer of wine in the world. And while the LCBO does purchase and promote Ontario wines in a respectable fashion, getting a product listed within a system that huge is arduous. Hulley says Ontario producers view BC’s system of VQA shops, like the ones in the Wine Museum in Kelowna and the Wine Information Center in Penticton, as revolutionary. They applaud it as a sensible distribution method that both embraces and fosters the industry, while making local wines accessible to consumers. Unfortunately, Ontarians are a long way from putting anything similar into place, Hulley says. The first step is to hold the glass by the stem and look through the wine against a white back-ground to enjoy the true color. The wine should be clear, not hazy or cloudy. White wines range in color from a very faint almost clear to a golden yellow. Red wines range in color from a dark,intense red to a very light pale red. To get the full aroma of the wine, fill a large wine glass halfway and swirl the wine around in the glass. This releases the aromas to the the top of the glass. Inhale and try to identify what you smell. Do you smell fruit or spices? Does it remind you of mom’s apple pie or a cobblestone street after a rainfall? You might find hints of familiar smells including – tobacco, citrus, apple, chocolate, plums, pineapple, flowers or raspberries. While contemplating the smell, look at the wine and notice whether it’s thick or thin, whether the color is bright or mellow or whether it’s clear or hazy. Roll the wine around in your mouth to reach all of the taste buds. Then, breathe air through your lips to bring up the aromas. If the wine makes you pucker, it may be a little tart (high in acids) or tannic (think dry like banana skins and tea leaves): if it feels hot and burns a little, it may have high alcohol content; if none of these elements overwhelms you, it is very likely well-balanced. Notice how it feels in your mouth, this is called the texture. It sounds funny and may make you a little uncomfortable, but if you are tasting several wines it is essential to spit. It provides you with the opportunity to taste several wines in one sitting. If you are just trying a few go ahead and swallow. A wine that lingers in your mouth and throat after you have spit is a sign of good length and body.